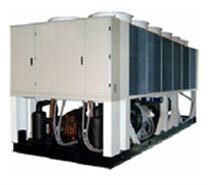 Air-cooled screw heat pump unit is one of the widely-used unit in central air-condition field, its excellent characteristic has got favor of users such as big capacity of one unit refrigeration but small bulk, convenient install with excellent consume and without refrigeration tower; But the complexity of this kind of unit makes many air-conditioner unit manufacture finch. With many years familiar to this kind of unit and combination of control experience, Goldair puts forward MCB-II Fan screw heat pump unit. After following-years actual running, MCB-II is proved its stability of control system and superiority of control process and has been adopted by more and more manufacturers. The control system main consists of followings: Mcx controller, MCB- control board, and MVC EEV controller etc. It may control the electric expansion valve.